Many thanks go to those of you who took time to nominate well-deserving herds for this year’s Reproduction Awards program, which recognizes outstanding dairy operations for reproductive efficiency and well-implemented management procedures. We received 80 nominations. While that is off from last year’s record 128 nominations, this year’s total is double what we received in 2014. Gardner & Gardner Communications (G&G) has been on board as our association management team since mid-March. I’m pleased to report that the transition has been nearly seamless. The G&G team jumped in immediately and distributed several news releases, prepared newsletters, worked with our volunteer sponsorship committee in seeking webinar and annual meeting sponsors, procured a vendor to coordinate webinars, transferred funds to our new bank, updated budgets, opened new financial accounts and updated the DCRC website. I’m extremely optimistic for what lies ahead for DCRC as we build our relationship with G&G. As mentioned, G&G spearheaded an update of the DCRC website. While you won’t see a lot of visual differences, the updated site on the back end includes a new membership management system. Look for an e-mail from DCRC that explains the new login process. If you have any membership-related questions, contact Membership Director Kyle Wieskus. Speaking of membership, membership renewals will go out in July via e-mail. Keep an eye out for this e-mail and renew your DCRC membership ASAP. Encourage your colleagues to join DCRC, too. We’re adding a pre-conference symposium to this year’s annual meeting in Reno, Nev. So far, Merck and Elanco have agreed to offer and sponsor presentations during the symposium. Watch for more information as sponsors reveal the topics they will address during the pre-conference symposium. We still have a couple spots open during the pre-conference symposium. Contact Den Gardner or DCRC Finance-Sponsorship Co-chairs Scott Poock and Brent Cousin to see how you can be a part of this educational opportunity. Don’t forget the June DCRC webinar (June 23, at 1 p.m. Central Time), featuring John Lee. He will discuss effective heifer rearing programs and help dairy producers evaluate heifer management strategies and offer some tips on producing an adequate (or more than adequate) supply of quality replacements. 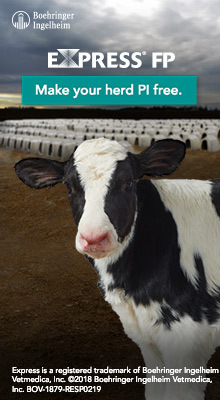 Learn what it takes to get heifers to express their genetic potential. The authors compared 2 reproductive programs for the management of first postpartum artificial insemination (AI), based on activity monitors and timed AI. Lactating Holstein cows (n = 918) from 2 commercial farms were enrolled. Estrous cycles of all cows were presynchronized with 2 injections of PGF2α administered 2 wk apart. Treatments were (1) first insemination performed by timed AI (TAI) and (2) first insemination based upon the detection of estrus by activity monitors (ACT; Heatime, SCR Engineering) after the presynchronization. Cows not inseminated by the detection of estrus were enrolled in the Ovsynch protocol. The results were published in the June 2017 issue of the Journal of Dairy Science. On the ACT treatment, 50.5% of cows were inseminated based on detected estrus, whereas 83.2% of the cows on the TAI treatment were inseminated appropriately after the timed AI protocol. Pregnancy per AI did not differ by treatment (30.8 vs. 33.5% for ACT and TAI, respectively) and success of pregnancy was affected by parity, cyclicity, BCS, and milk production. Anovulatory cows and older cows had compromised pregnancy outcomes on the ACT treatment but not on the TAI treatment. Hazard of pregnancy by 300 DIM was affected by farm, parity, BCS, a treatment × cyclicity interaction. Detection of estrus was affected by farm, parity, cyclicity, and leg health, but not BCS or milk production. Expression of estrus was compromised in anovular and older cows, and by the timing of the estrous event. Increased duration of estrus, but not intensity of estrus, improved pregnancy per AI. In conclusion, using an automated activity monitor for the detection of estrus within a Presynch-Ovsynch program resulted in similar pregnancy per AI and days open compared with a reproduction program that was strictly based on timed AI for first postpartum AI. Notable variations in reproductive outcomes among farms suggest that the use of automated activity monitors varies by individual farm management aptitude. Circulating concentrations of Anti-Müllerian Hormone (AMH) are positively correlated with the number of antral follicles growing during follicular waves [antral follicle count, (AFC)]. However, previous studies show a quadratic response for reproductive performance, productive herd life, and survival rate, where the best response are achieved by cows with intermediate AFC compared with cows with high or low AFC, or AMH. In this study, researchers tested the hypothesis that fertility and productive herd life are lower in dairy heifers with high follicle numbers compared with age-matched herdmates with fewer follicles. Results were published in the June 2017 issue of the Journal of Dairy Science. Holstein heifers 11 to 15 months old (n = 408) were subjected to a single ultrasound measurement of the number of follicles, after 2 doses of PGF2α, and classified into high- (≥25 follicles), mid- (16–24), or low-range (≤15) follicle number group (FNG), and then followed up for performance and reproductive and health parameters until their fifth to sixth lactations. Heifers with high-range FNG had a 180-d shorter productive herd life, reduced survival rate, and greater probability of being culled after birth of the first calf compared with heifers in the low-range FNG. Cows in the high-range FNG had greater days open and services per conception, and lower pregnancy rates during the first, second, or third lactations, compared with cows in the low-range FNG. The authors evaluated the effects of intrauterine infusion of Escherichia coli lipopolysaccharide (LPS) in cows diagnosed with purulent vaginal discharge (PVD) on intrauterine cell population, resolution of PVD, uterine health, and reproductive performance. Purulent vaginal discharge was diagnosed at 35 ±6 d postpartum and 267 cows were randomly assigned to receive an intrauterine infusion of 20 mL of phosphate-buffered saline (PBS; control, n = 87), 20 mL of PBS with 150 µg LPS (LPS150, n = 91), or 20 mL of PBS with 300 µg of LPS (LPS300, n = 89). The results were published in the June 2017 issue of the Journal of Dairy Science. Count of polymorphonuclear leukocytes (PMNL) in uterine cytology 1, 2, and 7 d after intrauterine infusion was not statistically different among treatments. Treatment did not affect the likelihood of cows being diagnosed with PVD 7 and 28 d after intrauterine infusion. Cows without PVD and LPS150 cows were more likely to be pregnant after the first postpartum AI than PBS cows. After the second postpartum AI, cows without PVD were more likely to be pregnant than PBS and LPS300 cows. Hazard of pregnancy up to 200 d postpartum was decreased for PBS and LPS300 cows, compared with cows without PVD. In conclusion, intrauterine treatment with 150 µg of E. coli LPS of cows diagnosed with PVD improved likelihood of pregnancy after the first postpartum AI, but further research is needed to elucidate the mechanism by which LPS treatment improved fertility. Less than 2 percent of the U.S. population is directly involved in production agriculture. The average American is at least three generations removed from a farm. Consequently, most people possess little knowledge of modern production agricultural practices. Their paradigm of dairy farming might be a little red barn and “Grandpa” milking the cows. If consumers are aware of current technologies (e.g., antibiotic treatments, hormone supplementation, artificial insemination), the management tool might be tainted due to anti-animal agriculture groups (e.g., People for the Ethical Treatment of Animals [PETA], Humane Society of the United States [HSUS] and American Society for the Prevention of Cruelty to Animals [ASPCA]) “throwing rocks” at these science-based management strategies. While the agriculture industry will struggle to change extremists’ attitudes about modern agriculture, there are many in the middle thirsting for a better understanding of how their food is produced. The best group to accomplish this is farmers and their allied agricultural partners. Telling the agriculture story should not ride solely on farmers’ shoulders. Dairy advisers should also help deliver soundbites that convey messages of animal care and environmental stewardship, in addition to producing safe, wholesome and nutritious food. “All agencies, from our cooperatives to the U.S. Department of Agriculture, should speak in unity with the sole goal of ensuring the consumer that all farmers and farming practices are safe,” said McCloskey. To address these anti-animal agriculture groups’ claims, McCloskey, his wife and fellow dairy farmers founded Fair Oaks Farms, an agri-tourism attraction in northwest Indiana, in 2004. It started with a few exhibits, a movie and a bus ride through one of their dairy farms. Fast forward a decade later and you’ll find a “campus” of attractions that include a modern 3,000-sow farm, pork education center, state-of-the-art egg laying barn, orchard, vegetable farm and a café that serves Fair Oaks cheese and ice cream. Additionally, a Fair Oaks “partner” – Winfield Solutions, a subsidiary of Land O’Lakes – stepped in and opened Crop Adventure last year. The 10,000-square-foot facility tells the story of soil, seed and sustainability. Based on his agri-tourism experiences, McCloskey feels that the average consumer simply wants to know that farmers are doing their best and looking to improve every day. “Our biggest satisfaction and accomplishment is that our visitors walk away trusting that we are doing right by our animals, our land, our employees and our communities,” he stated. While some may describe Fair Oaks Farms as a “factory farm,” McCloskey feels they have persuaded consumers to understand that “big is not bad.” Due to their scale of economy, the business can implement progressive and sustainable practices (that smaller businesses couldn’t justify). Whether you’re a dairy producer milking 15,000 conventional cows or 50 organic cows (or adviser for one of these dairies or something in between), farmers should speak the same message to consumers and support each other’s practices and products. Why? Consumers are confused due to the mixed messages they hear from those without agricultural backgrounds and from “irresponsible marketing” delivered by some companies. When it comes to antibiotic and hormone use, dairy producers should look for good science and adoption of technologies that can help tell a successful and trustworthy story. “We believe it will take all kinds of farming and farmers to feed our growing planet – from small to large, organic to conventional, from Kansas wheat fields to vertical farming in a Chicago warehouse,” McCloskey remarked. Modern farming practices provide U.S. consumers with an abundance of choices, a luxury of affordability and a security of safety offered by no other country. “Transparency in what we do on the farm is a tool that should be in every farmer’s toolbox,” McCloskey concluded. Perry Vet is a full-service veterinary clinic based in the heart of western New York. Four locations are staffed with 32 veterinarians that serve the needs of our small animal and dairy clientele. We service more than 200 dairies from Lake Ontario to Pennsylvania and Lake Erie to the Finger Lakes. A partner and active dairy practitioner, I also chair the clinic’s retail committee, which means I am frequently in contact with pharmaceutical companies, dairy processors and others. Through this interaction, I have a different perspective of the dairy industry than most veterinarians. I realize that the American food consumer has many choices today and we must evolve rapidly to appeal to them through our actions on the farm, in the media and in retail space. A frequent interaction with pharmaceutical companies allows me to see some new products early and serve in an advisory function. When presented with a new technology or technique, we must ask ourselves how the public will perceive this rather than just how will it make dairies more profitable or productive. A native of southern Ohio, who was raised on a hobby beef farm, I graduated in 1997 from The Ohio State University with a doctor of veterinary medicine degree. I started my career in Miller, S.D., working in the cow-calf and feedlot industry. In 1999, I took a job at the Veterinary Medical Center in Worthington, Minn., and began to focus on the dairy industry. A year-long certificate course at the University of Minnesota sparked a fascination with the dairy industry that remains with me still. With a desire to move closer to home and work exclusively on dairy cattle, I joined the Perry Veterinary Clinic in 2001. My interest in dairy cattle reproduction started in high school when I took an AI course. As an undergrad, I took a theriogenology class that focused on reproductive cycle manipulation through the use of reproductive hormones. Practicing in South Dakota, I soon realized how poor dairy cattle reproduction had become relative to the beef industry. Concurrently, Midwest dairy farms were distressed financially. There simply weren’t enough cows in barns to drive profitability or grow dairy operations. Reproduction failure deserved a lot of the blame. I began to focus on trying to improve this on farms I worked with. With these concerns, it made sense to create an organization like DCRC – a multi-disciplinary forum that addresses reproduction from a variety of avenues, including nutrition, animal health, artificial insemination and theriogenology. DCRC is the place to be if you have an interest in any of these areas and how they impact reproduction success. DCRC is the crossroads of the dairy reproduction industry. Through DCRC’s common forum, all entities come together and discuss data. It’s extremely valuable when DCRC members bring up a reproduction-related topic and ask, “What about this?” and “What about that?” Reproduction is not just physiology. Considering that DCRC just celebrated its 10th anniversary, the organization has experienced a quick and prominent rise. Lots of people talk about DCRC and I believe this is due to its cross-discipline approach. DCRC is a clearinghouse of reproduction knowledge. I also appreciate university associates’ expertise and perspectives. The DCRC annual meeting’s poster session shares a lot of cutting edge information. I also appreciate dairy producers’ input. They try a lot of interesting and unique protocols, techniques, products and services. Their perspectives are so important when it comes to applying research recommendations. While great strides have been made in improving dairy cattle reproduction, challenges remain. I think the biggest obstacle is understanding and applying genomics appropriately. Conception rates have increased and this must be due to conception rate genomic information. However, without proper training, genomics can be misused. Looking to the future, I believe DCRC will remain a relative partner for the dairy industry. This forum of research, discussion and application will help drive reproduction success and ultimately dairy farm profitability. For DCRC to be successful, we need to continue good attendance across a variety of industry segments. Mark your calendars for the Dairy Cattle Reproduction Council’s 2017 webinar series. These highly regarded sessions offer attendees from across the United States and around the world access to high-quality information and interaction with industry experts from the comfort of their farm or office. The 2017 series will feature six presentations, giving you numerous opportunities to learn more about important dairy reproduction topics. The informational series begins with its first webinar Friday, Feb. 24, and continues every other month throughout 2017. The webinars feature top-rated topics from previous DCRC Annual Meetings, as well as other areas of reproductive importance. Again this year, DCRC will offer a webinar in Spanish—slated for Dec. 15. And for the first time, DCRC will offer a webinar in Portuguese, which is scheduled for Oct. 27. For more information, email Dr. Pablo Pinedo, DCRC Education Committee Chair, at Pablo.Pinedo@colostate.edu or email DCRC at kristym@dcrcouncil.org. Society for the Study of Reproduction 50th Annual Meeting, July 13-16, Washington, D.C.